Children have to be educated, but they have also to be left to educate themselves. Abbé Dimnet, Art of Thinking, 1928. When you’re 6 years old, everything seems fresh, new, obtainable, and of course you know it all. There really isn’t a question of “if” or “when,” but more “I can do it myself” mentality, at least it was for me. 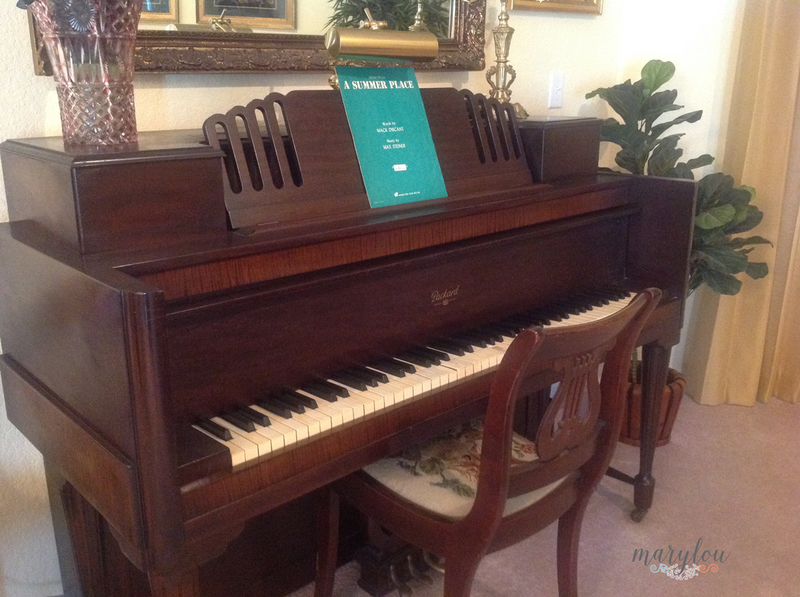 I walked up to mom’s piano one day, pulled out the learner songbooks from their nesting place in the piano bench, set myself down and started to play. Peck was more like it. I remember a cheat sheet I placed above the keys so I could learn finger placement and the notes that related to each key. Starting with the scale I moved through the learner lessons. My first real song was “Twinkle, Twinkle, Little Star” which I remember playing over and over again. Drove everyone crazy. I’m sure the house cleared quickly with all the missed notes. I didn’t care, unless I was forced to stop playing. I can’t remember the instigator, but most likely it was a quest to out shine my older sister who took professional piano lessons. Being an accomplished pianist, mom encouraged us girls to follow suit. In my mind if my sister could play, certainly I could too, and play better than her. I was so happy, probably showed off that I could teach myself what took her years to learn. I could do it myself. And I did, never taking formal lessons. Mom never pushed me too either. She guided and helped me along the way though. I felt like a twinkling little star. Mom’s piano always held a sweet spot in my heart. She and I would play duets, her playing the organ with me at the piano. For me it was a major accomplishment. I never pursued playing professionally, nor mastered playing the piano. I enjoyed playing the piano as it was a comfort zone, a refuge while going through the period when our family’s lives changed due to my brother’s Missing in Action status. I can still visualize playing some my favorites, “A Summer Place”, “Birth of the Blues”, “Happy Together”, “Alley Cat”, “Green, Green Grass of Home”, and so many more. I now have mom’s 1934 Spinet. I even have her payment booklet noting each $7.00 weekly payment she made for it during the Thirties. The keys stick. It’s out of tune. I can’t part with it though. Every so often I sit down to practice the scale and try my luck playing a favorite tune using my old worn sheet music. Brings back many precious memories. Learning to play the piano brought me a sense of accomplishment, comfort in difficult times, and remains a visual connection to my childhood. My sister still plays (better than me I’m sure). I haven’t played consistently in years. Maybe it’s time get it playable again so I can peck at those keys. Twinkle, twinkle, little star.